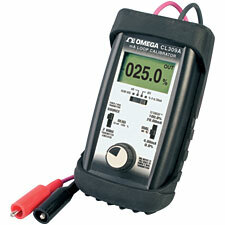 Model CL309A is a state of the art, highly reliable, rugged and easy to use milliamp calibrator. It has the functions necessary to perform all the required maintenance and calibration tasks of virtually any 4 to 20mA loop. It provides source and read milliamp functions along with power, measure, and 2-wire transmitter simulations. In addition, it can measure DC Voltage for troubleshooting power supplies. Nota: Comes with test leads, operator’s manual and 9V alkaline battery.